June over at Twosheep recently wrote about a tubular cast on. That sent me off looking up various ones. June recommends the one from Montse Stanley’s Readers’ Digest Knitters’ Handbook, although she notes that doing it in stockinette is not as stretchy as doing a ribbed tubular cast-on. She gives links to a couple of nicely photographed instructions at My Fashionable Life, and Little Purl of the Orient. I don’t have that particular Stanley book on my shelf, but I use an entirely different tubular cast on than the one described at those sites and in the book. I learned an at once more fiddly and simpler method for a ribbed tubular cast-on during the second sweater I ever knit – Penny Straker’s Eye of the Partridge unisex raglan. Straker’s pattern format included a side bar with helpful advice or bonus illustrations of techniques and tricks. This one included instructions for the cast-on I did Partridge as a gift for one of my sisters. I knit it in Germantown worsted (very much like Cascade 220), in an dusty antique rose and a deeper, almost blood rose for the darker complementing color. It’s long gone now otherwise I’d put a photo here instead of the sample photo from the pattern, shamelessly lifted from a web-based retailer (the pattern itself is still available, and also comes in a kids’ version). 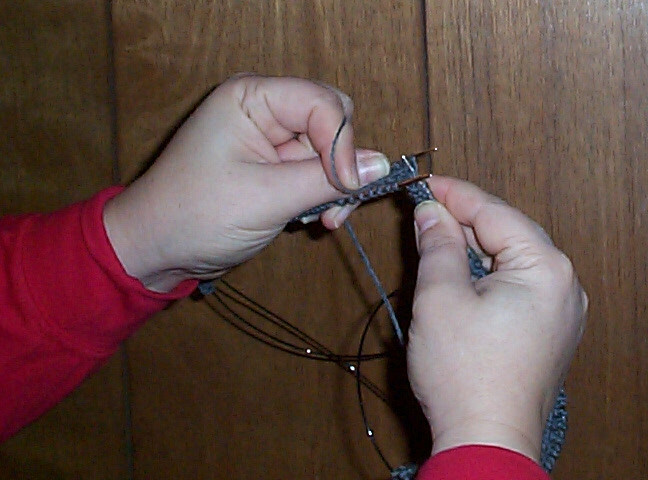 Straker’s method calls for using a provisional cast-on, and casting on half of the stitches called for in the pattern. 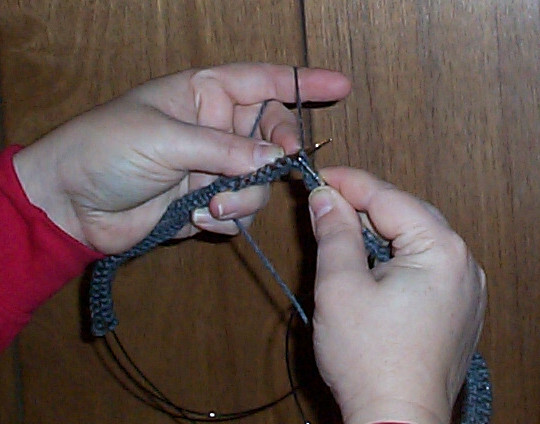 If for example, the pattern asks for 100 stitches, I cast on 50. 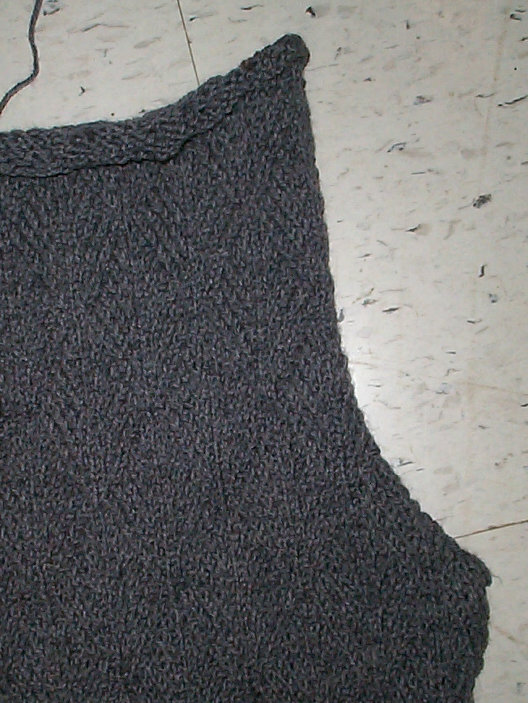 Then I knit in plain stockinette for four to ten rows (usually 6). At the completion of the last row, I unzip my provisional cast-on, and place all the newly freed stitches along the bottom edge onto a second needle. I often use a needle one size smaller than I used for the stockinette piece to make this easier. When I’m done, I have a nice, neat, stretchy tubular edge in K1, P1 rib that can be made wide enough to accommodate a drawstring. I use this routinely for almost all of my hem edges – even for circular knitting. I’ve made the small divot at the join into a design feature on some pieces where I’ve started my cast-on at the neckline. On others, I’ve used the dangling tail to snick it up and make the starting point invisible. 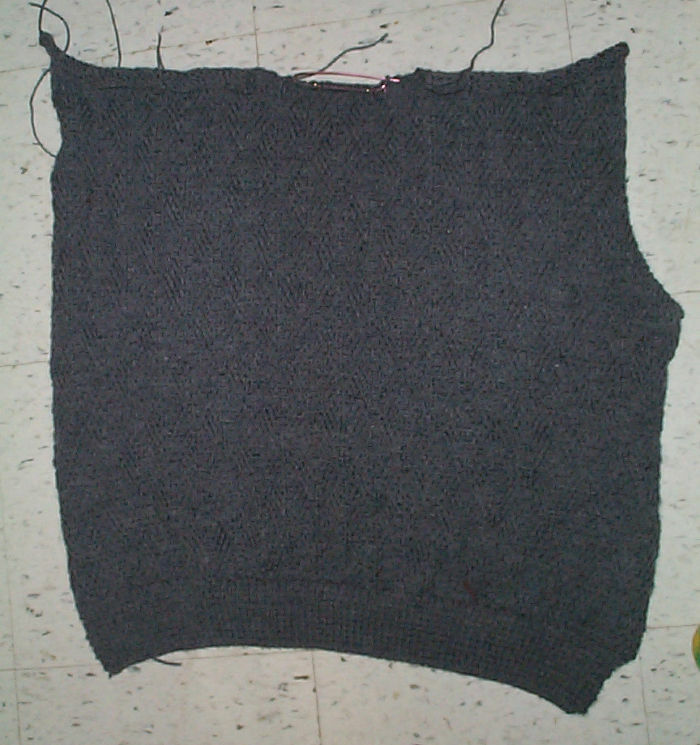 In this case, I broke into twisted rib the row immediately following the cast-on row. How’s the leaf sweater coming? The front of it is starring in the cast-on photos, above. Here’s the back – blurry and hard to see, but proof that I’m done with it. Also proof that yes – a texture pattern that’s mostly stockinette will also curl. And because I’m still sniffing around for a small project to run in parallel with my leaf sweater, plus I’m having fun with my ancient Unger Britania– I’ll take another lead from June. It’s mittens next. The shape of a traditional Norwegian mitten looks pretty simple, yet with ample scope for fun. Hello Yarn offers a PDF of a blank mitten graph. I think I’ll take that idea and run with it – redrafting the template for a smaller gauge, and using some of the historical graphed charts from my book on embroidery. If nothing else, I’ll enjoy the doodle time. Where has this been all my life? Amazingly simple and clever — thanks!